Execute a winning marketing strategy with Nuclino as an easy knowledge base to plan campaigns, draft content, and more. Multitasking is part of every marketing team's DNA. Whether it's tracking and analyzing campaigns, planning editorial calendars, managing social media channels, or designing landing pages, the team needs to operate as one, making sure every member is on the same page. Nuclino offers a transparent and organized virtual workspace where your marketing team can easily communicate and collaborate in real time, make decisions together, and stay connected every step of the way as you plan and execute your next marketing launch or creative campaign. Plan marketing campaigns capturing all important knowledge in one place. 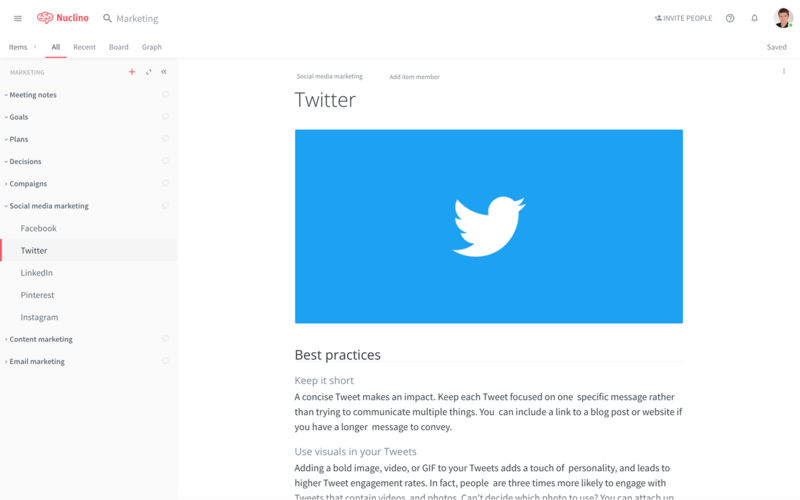 Draft content like social media posts and get feedback from your team. Plan and track all your marketing projects in an easy and visual way. Collaborate with your team in real-time on any marketing-related content. Use comments to give and receive feedback on content in any stage.